Swimming usually isn’t my first choice for being active, but once I get back into the pool I start getting addicted. There’s something about emerging from the water after some serious laps, peeling off a wet swimcap and releasing the suction cup of goggles that makes me feel so alive. Let’s face it, though, swimming isn’t one of the easiest sports to get into. It requires special equipment (a heated pool), some basic skills and a fair amount of time. Getting in a “quick swim” is no easy feat – you have to get to a pool, shower, swim, and shower again – it’s not like yoga or a brisk walk where you can sneak back to the office after a workout with a quick towel-dry. Yet there is something addictive about swimming, especially when you’re pregnant or just starting out a new fitness regime. And according to the 2008 Physical Activity Guidelines for Americans, it’s a sport that pretty much anyone can do, from childhood into older adulthood, and even among those with disabilities or chronic health conditions such as osteoarthritis. Once you have access to a pool, the rest of your “gear” needs are easy – you really just need a swimsuit and yourself. A pair of goggles is helpful for being underwater, and a swim cap is nice to have to protect your hair. I also use silicon ear plugs, since I hate hopping on one foot to get the water out of my ears. It’s perfect for people with joint issues or those who need a non-impact workout. Swimming is a great exercise when you’re pregnant, as it’s easy on the joints and ligaments and makes you feel weightless. The breaststroke in particular can help strengthen muscles needed for childbirth, as well as stretch back muscles that can get tight during pregnancy and early motherhood. If you’re new to a workout routine, are overweight or recovering from injury, pool exercise is a gentle but effective workout. It can be a serious cardiovascular workout. Lap swimming engages your entire body, especially the freestyle (crawl stroke) which works your arms, legs and core. Timing your breathing with each stroke also works your respiratory system. Water running and water aerobics are also major calorie burners. It’s meditative. I first got into swimming during a particularly tough time in my life. Being underwater was a welcome silence and allowed me to be free with my thoughts. For some people, the silence can be deafening, but there are actually waterproof mp3 players you can get if listening to tunes is the best way for you to pass the time and keep you energized during a workout. The possibilities are as limitless as your imagination. “It’s boring!” is the first thing people say to me when I suggest swimming as an activity. Yes, you swim up one length and back, but there’s so much that can happen in between – so many ways to challenge your muscles. You can do alternate strokes with each lap, working different muscle groups and giving your breath a break (if you do backstrokes, sidestroke or water running), work with props such as kickboards to concentrate on your legs or a wedge between your legs to challenge your upper body. Play with your cadence, speed, etc. When I swim as part of my prenatal exercises, I like to swim 40 laps to coincide with each week of pregnancy (or I swim to whatever week I’m currently in, depending on how my body feels). If I get bored, I think about the particular “week” I’m swimming, either reminiscing about what things were like that week, or planning what I’ll look and feel like if it’s a week in the future. I guarantee you, with a little mindplay or shaking up your activities, your time in the pool will fly by. While the Physical Activity Guidelines rate swimming among one of the lower-risk activities, people must take certain precautions. First of all, never begin any new activity without first consulting your doctor. 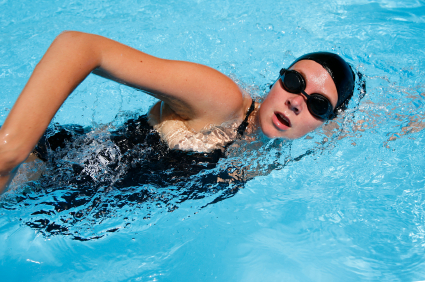 And second, swimming – like any cardiovascular activity, can be dehydrating. Keep a water bottle poolside and sip regularly throughout your workout. Don’t be afraid to put that bathing suit to use and get in the pool. It’s refreshing, and you’ll feel great.